Heat the oven to 275°F. Line a cookie sheet with a piece of foil or cooking parchment paper. Add the cream of tartar to the egg whites; beat with an electric mixer on high speed until mixture looks foamy. Beat in 3/4 cup sugar, 1 tablespoon at a time; continue beating about 5 minutes, stopping occasionally to scrape mixture from side and bottom of bowl with a rubber spatula, until mixture is glossy and forms stiff peaks when beaters are lifted. (Do not underbeat because the meringue shell won’t hold its shape.) On the cookie sheet, shape the meringue into a 9-inch round with the back of a spoon, building up about a 1-inch side. Bake 1 hour 30 minutes. Turn off oven; leave meringue in oven with door closed 1 hour. Remove from oven and cool on a cooling rack 2 hours longer. Place a medium bowl and the beaters of electric mixer in refrigerator to chill. These will be used to beat the whipping cream, which beats better in a cold bowl. Place block of cream cheese on a plate, and let stand at room temperature about 30 minutes to soften slightly. Or to soften cream cheese in the microwave, remove foil wrapper and place in microwavable bowl; microwave on Medium (50%) 45 to 60 seconds. In a large bowl, stir together the softened cream cheese, 1/2 cup sugar and the vanilla until mixed; set aside. Pour the whipping cream into the chilled bowl. Insert the chilled beaters in the electric mixer. Beat on high speed until whipped cream forms soft peaks when beaters are lifted. Gently fold the whipped cream and marshmallows into the cream cheese mixture. Place the meringue on a serving plate, and spoon the filling onto the meringue. Cover; refrigerate at least 12 hours to blend the flavors but no longer than 24 hours. Rinse the strawberries with cool water, and dry on paper towels. Cut out the hull, or “cap,” from each strawberry with the point of a paring knife. Cut the strawberries lengthwise into slices to measure 1 cup. In a medium bowl, stir together the pie filling, strawberries and lemon juice. To serve, spoon the berry mixture onto the filling. Or cut the meringue shell into serving pieces, and top each serving with the berry mixture. Line a cookie sheet with a piece of foil or cooking parchment paper. Drop meringue by 1/3 cupfuls onto cookie sheet. Shape into about 4-inch rounds, building up about 1/2-inch sides. Bake 1 hour. Turn off oven; leave meringues in oven with door closed 1 hour 30 minutes. Finish cooling at room temperature, about 2 hours. Make Cream Filling as directed; divide among meringue shells. Cover; refrigerate at least 12 hours but no longer than 24 hours. 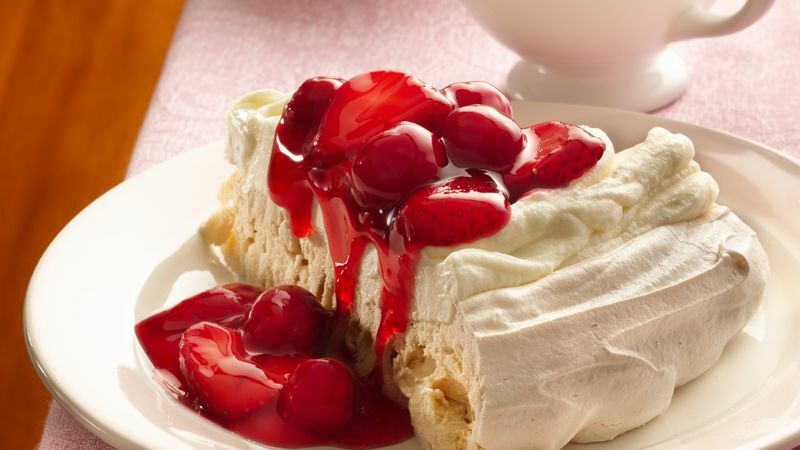 Make Cherry-Berry Topping; serve with meringues. Shape meringue with the back of a spoon into a round, building up the side.